Jack and Annie are sent back to the Alaskan Territory in 1925, along with two kinds of magic powders: one will give them super skills that will help them with their mission, and the other will make everyone forget that they were there. They soon find out why they have been sent. They meet Oki, whose mother and sister are ill with diphtheria, and the medicine that they need has been delayed. Oki, whose uncle has sled dogs, is determined to set off to meet the dog sled teams that are delivering the medicine, but a bad storm is coming and his uncle does not want him to go. Jack and Annie use their magic powder to give them the knowledge and skill they need to become expert "mushers", and they take off. They manage to find Balto and Gunnar Kaasen just in time for him to discover that the package with the serum is missing. They find the package, and the delivery is made in time. Once they are sure that all is well, they travel back to Frog Creek and are glad to be warm! The Magic Tree House books have been around for a very long time, and are a great introduction to a variety of historical events for beginning readers. They cover the basics, but I appreciate when they delve a little into some of the controversies: after reading Klimo's Togo, I knew that there were some issues with whether or not Balto was the dog who deserves the most acclaim. 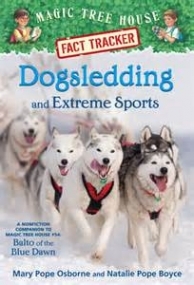 That is addressed briefly while still acknowledging that many dogs and mushers worked hard to avert catastrophe. Jack and Annie always dive right into whatever adventure is handed to them, and these books are a fantastic way to get historical content to beginning readers. Be careful, though-- one Magic Treehouse book is never enough! A definite purchase for all elementary libraries, and a series which also does well with my struggling 6th grade readers. I appreciate that the cover style has remained the same over the past 23 years! I wonder if there will be a big party for the 25th anniversary in July of 2017?